The new models bring a 4K screen, stunning colour performance and virtually no parallax. 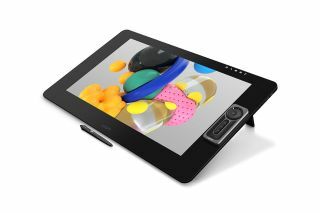 Today sees Wacom add two exciting new drawing tablets to its successful Wacom Cintiq Pro line of graphics tools: the Wacom Cintiq Pro 24 and the Wacom Cintiq Pro 32. Designed to help digital artists take their work to the next level, the latest releases deliver a cutting-edge and easy-to-use design experience that also caters for augmented and virtual reality. First up is the Wacom Cintiq Pro Engine and Cintiq Pro Displays. With the Wacom Cintiq Pro Engine, digital artists can convert their Cintiq Pro into a powerful creative studio. This is thanks to a creative PC module available in two configurations that transform a Cintiq Pro into a Windows 10 workstation. With these modules, artists and designers can run demanding creative applications and workflows, including systems for 3D work, animation, and virtual reality projects. By simply slotting the modular Cintiq engines into the back of the Cintiq Pro 24, designers instantly get computing power without the space issues and clutter that usually come with desktop devices. “It is our mission to help professionals create with the least amount of distraction and clutter and to give them the power to tackle the new spaces of creating content for AR, VR and MR," says Faik Karaoglu, Executive Vice President of the Creative Business Unit at Wacom. "The Wacom Cintiq Pro Engine provides a beautiful, easy to use solution for creatives everywhere." Priced at £2,399.99 and £3,419.99, the two versions will be available from May 2018. Watch the Cintiq Pro Engine in action below and see how it combines with the Wacom Cintiq Pro display to create a flexible creative module. The other latest innovation from Wacom is the Cintiq Pro 24-inch pen display. This new high performance display is also built for cutting-edge creative and design applications, including augmented and virtual reality. Tailored towards creative professionals after a larger digital canvas, this display packs the power to deal with an onslaught of creative applications and programs. This includes a 4k display, 98% Adobe RGB colour accuracy and a library of a billion colours to deliver a true-to-life visual experience. An improved pen experience tops off the release thanks to the new Pro Pen 2 technology that delivers a whopping 8, 192 levels of pressure sensitivity. Artists will also be able to experience a more natural feeling pen on screen experience thanks to etched glass surfaces, a reduction in parallax through optical scrolling, plus close to zero latency. “We know that professional artists and designers are facing an increasingly vast array of computing and display demands as they embrace emerging technologies like augmented and virtual reality, and 3D, where one size doesn’t fit all,” says Karaoglu. With prices ranging from £1,899.99 to £2,399.99, the Cintiq Pro 24 pen display models are available in the U.S., Japan and selected European countries as of March 2018. The Pen & Touch version of Cintiq Pro 24 will be available in May 2018. For full product details on all the latest releases, visit the Wacom site.